Poll: Should banned stars be allowed to play in Champions League final? The international players’ union says the slate should be wiped clean this time. Do you agree? 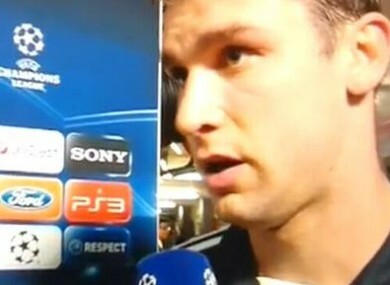 Sky's Geoff Shreeves breaks the news to Branislav Ivanovic. INTERNATIONAL FOOTBALL’S PLAYER union has today urged UEFA to pardon the six Chelsea and Bayern Munich players who are banned for next month’s Champions League decider, having picked up too many bookings. Chelsea stunned champions Barcelona at the Camp Nou on Tuesday night but it proved a pyrrhic victory with four players earning suspensions. Skipper John Terry was red carded for an off-the-ball knee on Alexis Shanchez and doesn’t have the support of the union, while Branislav Ivanovic, Ramires and Raul Meireles picked up third, crucial yellows. Bayern booked their place in the final at their own stadium but will, as things stand, line out at the Allianz Arena without Luiz Gustavo, David Alaba and Holger Badstuber. The players’ union points out that UEFA will adopt FIFA’s policy for Euro 2012 where existing yellow cards are waived after the quarter-finals. “Anybody committing a serious offence in the semi-final should be awarded a red card and miss the final. But the offences that result in a yellow card do not justify the serious punishment of missing the match of your life,” FIFPro spokesman Simon Barker said. So what do you think? Should the players banned for having too many yellows be allowed to line out in Munich? Email “Poll: Should banned stars be allowed to play in Champions League final?”. Feedback on “Poll: Should banned stars be allowed to play in Champions League final?”.